I have grown to like the idea of a Sunday brunch - for the fact that you get a good array of food and drink, a lovely ambience to laze around with family and friends, and even entertainment options for kids. Nobody can complain of not having something that will interest them and I can't think of a better way of spending a Sunday. Though, I still wonder why a brunch, which is technically breakfast and lunch, starts at lunch time and almost always doesn't have what should be at least a few breakfast dishes. Nuances apart, I have started liking the idea of Sunday brunches with the family. 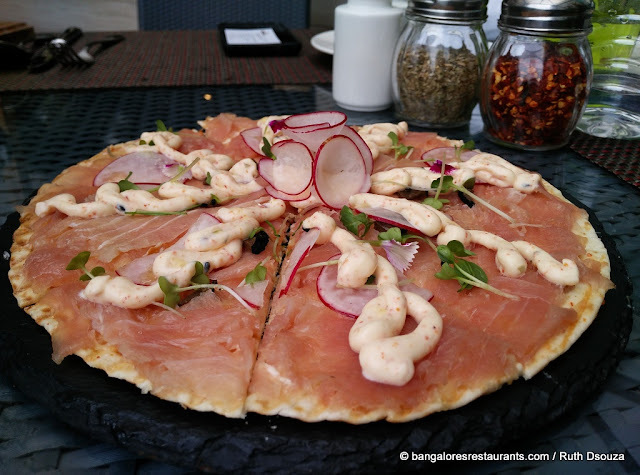 We were recently invited to experience the Sunday brunch at BG's, the rooftop/poolside space of the Courtyard by Marriott, Marathahalli. Considering this is a twin property, the restaurant is shared by Fairfield by Marriott as well. Only around a month into its Sunday Brunches, the focus of the brunch is of course on the Bar and the Grills, so do make sure that your sights remain on these two aspects for the large part. It will be hard, believe you me, considering how the spread, though not vast, has so many interesting things to sample that you will head out to every one of the counters for more than just a look-see. I have recently discovered this online collage making software calling Pixlr that works on my phone as well as online, without a horrible watermark of the brand. This post is going to be all my experiments with the software! And this is the view from across the pool standing at the Chaat and Indian counters. You could choose the high bar stool like seating which overlooks the pool and is an arm's distance from the salads, paninis and cold cuts counters, or go on ahead and sit under the massive shades, closer to the grills and Asian section. Either ways, Bangalore's weather right now is at its best and this place completely exploits that. I always like to walk around a buffet spread and make a mental note of where I want to stop and what I want to have. We were started off at the table with pass around starters of Fish Fingers, Chicken Popcorn and Prawn Tempura - each one bang on, on the crunchiness and the feel good factor. The salads and cold cuts are my favourite way to start on a buffet and BG's does not disappoint in both. Yogurt marinated beans with cherries, chicken roulade with cheese and fresh herbs, Grilled pimentos terrine, Gravlax - yes, the salads are not run-of-the-mill - each one has been well thought of and the presentation on some warrant the individual photos below. My picks were the Stuffed Squid with Orange Reduction that you can see in the collage, bottom row middle and the ones below! Now, what is a brunch without some good drinks to go with it? Often the onus of making a brunch a success lies equally on the shoulders of the bartender as it does on the chef. And it was now the turn of Tushar to impress. BG's has an interesting thing going at every brunch - focus on one classic drink - It was the mojito when we visited. The martini has been another. The bar also makes it own syrups and alcohol bases making each drink unique. Take the Mugga - a Mug with a base of peach reduction with an overturned bottle of beer gradually filling the mug up. Clean, fresh flavours and a lovely balance of the peach and beer. The Rainbow which comes with a support stand of its own is layers of vodka infused into syrups of varying density to give you this tall glass of goodness, topped with crushed ice. You have to stand up in appreciation and to drink it as well. We also had the Toxic - Blue Curacao, Orange Juice and Triple Sec. The Mojito bar set up had some great fruity bases to work with and you could even get drinks customized to your liking. Smoked #cinnamon, whiskey, Earl grey and #gin make this fabulous concoction here at the BG's! The Smoked Cinnamon Whiskey Drink has to find its way to your table. 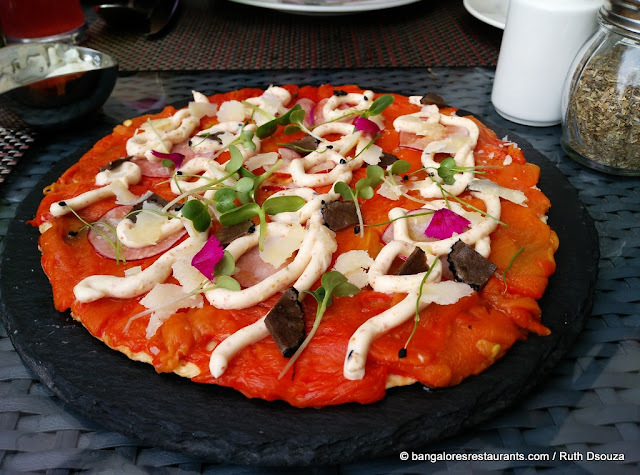 I have never heard of a cold pizza (other than the slices that end up chilling in my fridge) being served at a restaurant and jumped at the idea of having a cold pizza with blanched bellpeppers, Japanese mayo, truffle oil, radishes and microgreens. The bellpeppers have been blanched, hammered out, seasoned and chilled. This forms the first layer of the pizza which you simply must sink your teeth into. The lingering flavour of the truffle oil, the sharpness of the Japanese mayo, all make it a fabulous brunch dish. This was followed by a tuna version which though good was not right up there with the bellpepper version. The Khowsuey counter has enough of ingredients to make sure you get a version that you can comfortably say you have customized. The broth could have used a little more depth in terms of the flavours. I personally found the coconut milk a little too watered down. Easily remedied though. There were a few interesting bakes like the Corn and Spinach, Green Pea and Almond, the Cheese Steak with Ratatouille Vegetables. But what I loved the most was the gorgeously set up Pork Belly sitting pretty amidst grilled apples, figs, baby carrot and applesauce. We then got to the grills, which is the heart of this buffet. All the meats are on display, right next to the pasta counter. Each one with an interesting marinade and hint on its provenance. We sampled a range, and wished we hadn't filled up on the starters and salads. Very few places treat their meats with respect and fewer still that get it right for all their meats. The team here deserves all the credit they get. The Indian section is but natural and they have a good choice going on in the tandoor section and in the mains. The Gosht Nihari and Gosht biryani with the Baingan ka Salan are spot on. even what you want to start with!